The great state of Texas loomed large as a potential travel destination for years but our team here had not yet made the trip . That changed when we visited Houston, America’s fourth largest city. Despite having so much to offer as a tourist destination, Houston somehow seems to fly under the radar in the popular consciousness of travellers, both domestic and international. It shouldn’t. Even travelling chef/TV host Anthony Bourdain had overlooked Houston for 15 years and while we were there the foodie crowd was buzzing in anticipation of a soon-to-air episode on Houston culture and cuisine. Houston has something for everyone: the shopper, the bar hopper, the foodie, the artist, the sports enthusiast, the culture hound, even the nature lover. Here are just a few of the diverse experiences, not to mention cuisines and cultures, that Houston holds in store for you. When travelling, I usually try “not” to stand out as an obvious tourist. That had included avoiding the city tour bus in favour of taxiing and, more often, walking around. This time, however, having arrived early in town with virtually no sense of what to expect or where to go, when the option of a midday tour atop a London-style red double-decker presented itself we (literally) jumped aboard. Particularly because it was a warm, sunny day in late October that needed to be enjoyed. The wide-ranging guided tour around Houston was an exceptional experience I recommend to newcomers and plan to do more of them myself in the future when visiting a new city. The trick is to take this tour on the first day of your visit, learn about the city, get your bearings, and see interesting sites and neighbourhoods. You can then make plans to go back and properly visit those that really caught your attention. Houston, as in “Houston, we have a problem”, is home to the manned space mission operations for NASA, as well as the mission control for such flights. The Space Centre Houston, NASA’s visitor centre, is an amazing attraction that should be on your must-see list. For the history buff, science nut or dreamer, this is powerful stuff and really gets you thinking on an interstellar level. The Centre includes a huge indoor array of shows, exhibits, hands-on demos, impressive walk through zones and all sorts of space ships, equipment (and moon rocks). Outside, things get even more impressive as you can actually board the shuttle Independence which sits atop the actual modified Boeing 747 that flew the space shuttles across the country. Down the road at Rocket Park, don’t miss the chance to see the enormous (you can’t imagine) Saturn V rocket that the Apollo missions used to get into space. We spent a wonderful couple of hours out on rented bikes with Bayou City Bike Tours one afternoon (great to work off some of the food we’d been over-enjoying) discovering the bayou system and parks of Houston, particularly the massive Buffalo Bayou Park. The bike paths are well designed, safe, and extensive. Our guide was a colourful well-worn fellow with a wealth of knowledge on Houstonian history, both distant and more recent. During our ride, he showed us how important the bayou/river system was to the founding and growth of Houston, and its inherent risk when flooding (which came to pass in an unimaginable way in 2017). We were very fortunate to be in town as things were getting into gear for the second edition of the Houston Urban Experience (HUE) Mural Festival. Artists from all around the world were in town to transform walls and sides of buildings into one of the biggest art displays in the world. 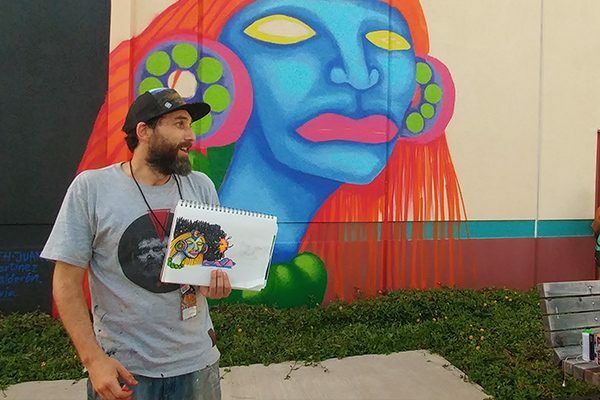 One of the most famous American graffiti artists, Houston native Gonzo247 (aka Mario Figueroa Jr.) took us into his world as he gave us the background of the movement. We toured countless completed masterpieces and saw numerous artists working on graffitis that were still in various stages of completion. Another must-see when in town, the murals can be viewed all year round. Houston is a great sports town and being America’s fourth largest city it comes as no surprise that the full complement of pro sports teams is here. With the Houston Rockets in basketball, Texans in football (and the Oilers before them), MLS soccer team Houston Dynamo and perhaps the best known, and oldest, the Houston Astros (yes, named after the local space program astronauts). We were lucky to get a special tour of Minute Maid Park, the new home of the Houston Astros (the old one being the iconic Astrodome, with its “astroturf”). Tours are open to the public, and even in the off-season it’s a great experience for all sports fans. One of our afternoons was dedicated to discovering the many museums Houston can be proud of. The various oil booms of the last century have brought significant wealth and equally significant support of the arts from private and public sources. We gave several museums a quick but good run through, and wonderfully some were free to the public. We took in a limited run of the Edgar Degas exhibition at the impressive Museum of Fine Arts Houston, a thorough and enjoyable stroll through the Contemporary Arts Museum (with work by nearly every modern painter and sculptor we could think of from Picasso to Warhol). We ended up at the Houston Museum of Natural Science (and its Cockrell Butterfly Centre) and missed a few more good museums along the way. A review of Houston wouldn’t be complete without a look at the truly diverse culinary offerings that we were able to sample and savour. Houston benefits from well established ethnic communities such as Chinese, Indian, Vietnamese, African and particularly the Mexican community. Our food experiences included Hugo’s, an upscale Mexican restaurant helmed by a charismatic and award winning chef and author Hugo Ortega, and Underbelly, the latest creation of equally renowned chef Chris Shepherd, a wonderfully unique farm-to-table creole fusion of all the cuisines of Houston and region. The baseball stadium tour was paired nicely with a visit to the nearby 8th Wonder Brewery (so named for the Astrodome often called the “8th wonder of the world”). Under the guidance of owner (and “hype man”) Ryan Soroka, we sampled an endless variety of beer brewed on the premises, which also serves as a bar, a restaurant and a venue for live music. Add in a visit to the local, cavernous House of Blues, elegant morning food and beautiful park scenery at The Dunlavy (possibly the top brunch spot in Houston), the casual patio vibe of LowBrow and the authentic Texan BBQ at Jackson Street BBQ, and instead of covering Houston cuisine, we had only just started. In fact, Houston’s 10,000 restaurants would take 30 years to get through one day at a time. A return trip is definitely in order, as the vibrant Houston food scene, and its nightlife are definitely worthy of entire articles. Talking about nightlife, our crew definitely took on Houston’s bar scene full force thanks to our local guide Mike who runs the Downtown Historic Pub Crawl (through Urban Adventures). This was one of the highlights of the entire week. We started off in Barringer Bar in an 1870s era building and worked our way through more historic/classy bars, the Houston Watch Co., Conservatory, Pastry War, and finally Dean’s Downtown, while our guide Mike told us stories along the way. Of course, after the official tour ended, there was still more “work” to be done, so we forged on with some of the great advice we’d picked up during our tour along the way. As a major North American metropolis, Houston boasts a full range of accommodations in all price ranges. We recommend staying downtown within walking distance of the bar/nightlife district and the Green Line public light rail that can take you to many key Houston neighbourhoods. We stayed at a lovely new property, the Aloft Houston Downtown, whose hip boutique hotel vibe and affordable rates target millennial visitors (like ourselves). The Aloft rooftop patio & pool bar looked promising as an evening hotspot, but had been delayed in its opening by a few weeks, darn! So maybe next time. Again, as a major U.S. city, most of the major airlines have reasonably affordable direct flights from and to major Canadian airports. Air Canada and Westjet are in on the route too. Designed for tourists, this booklet gives you admission tickets to multiple top attractions for almost half price while avoiding regular ticket purchase lineups. Lots of great places to shop in Houston but The Galleria, Texas’s largest shopping mall with 400 retailers and restaurants, is a good place to start. The Visit Houston website has lots of info and ideas.